Description: Whooper swans (pronounced “hooper”) are very large, second only in size to trumpeter swans as the largest swan in the world. Adults can weigh up to 9kg (20lbs) and have a wingspan up to 2.4m (96ins). 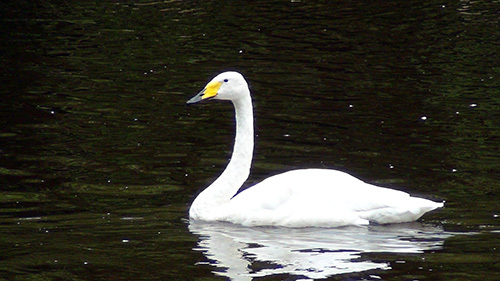 Completely white with black legs and feet, the whooper swan has a yellow and black bill. The yellow part covers more than half of the upper bill and is completely unique to each individual bird, similar to a fingerprint in humans. 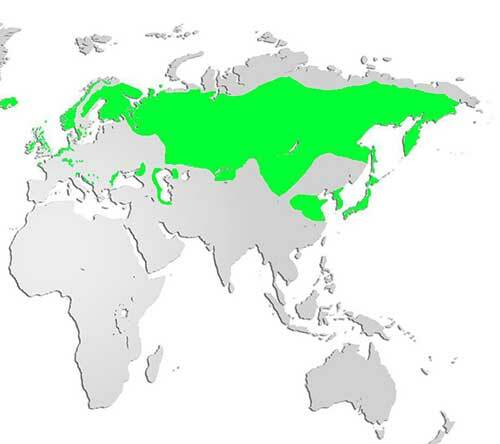 Distribution and Habitat: Native to northern Eurasia, small populations of feral Whooper Swans can be found in the US (birds who have escaped captivity and have bred successfully in the wild). Diet: Mainly herbivorous, whooper swans feed on aquatic plants and roots, grains, seeds, and nuts. They will also consume fish and insects, particularly when they’re younger and need higher protein levels to fuel their growth. Life Cycle: Whooper swans begin their breeding season in April and May, and a single clutch of eggs is laid per year. Nests are typically found on mounds of vegetation in a freshwater riparian area. Incubation lasts approximately 31 days, and the chicks leave the nest within a few days of hatching. Cygnets (young swans) become independent after a year, although they are able to fly after about 78-96 days, and are sexually mature after approximately 4 years. Did you know? Whooper swans form monogamous pairs and mate for life, although some may find a new mate if theirs dies.